Please use this online facility to order your stained glass effect house number to your exact measurements and with your own number. 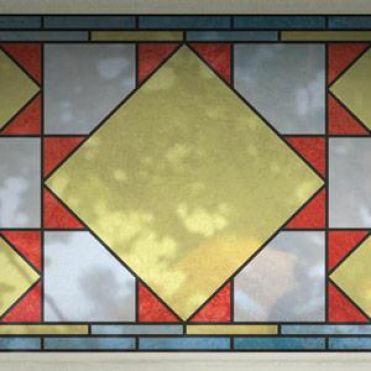 The end product is a cost effective alternative to stained glass, and is very easy to install. We will create your sticker by printing the design, including your number, either on a non frosted film, to allow the maximum of light through, or on a frosted film, for added privacy. With some of the designs, you'll also have the option to order matching film to go on the rest of your windows. Window film is best when applied internally, so select PRINT/CUT IN REVERSE in the Aspect settings. If the sticker has to be applied externally, then select PRINT/CUT AS SEEN. The finished product is easy to apply using soapy water and the application tool provided.